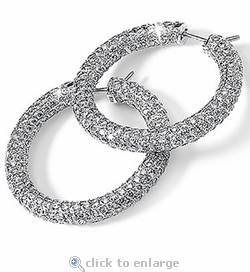 The Olympia Pave Set Round Cubic Zirconia Hoop Earrings are completely encrusted with prong set cubic zirconia rounds. 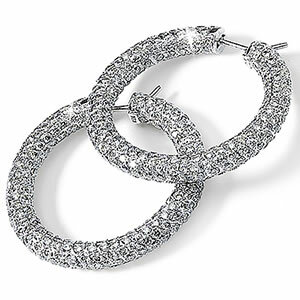 The hoops measure approximately 1.5 inches in diameter and include approximately 20 carats in total carat weight of the finest hand cut and hand polished original Russian formula cubic zirconia that will provide you with a stunning finished product. Choose from 14k white or yellow gold, 18k white or yellow gold or luxurious platinum. These earrings make the perfect accessory for a wedding, anniversary or any special occasion. For further assistance, please contact us directly at 1-866-942-6663 or visit us via live chat and speak with a knowledgeable representative.